Los Angeles has a lot of glitz and glam, but that doesn’t mean you have to empty your wallet to visit the city’s top attractions. Follow this wallet-friendly itinerary, or craft your own with our list of 100 free things to do in LA. Begin the day as early as 9 a.m. with a visit to architect Frank Gehry’s Walt Disney Concert Hall in Downtown LA. Get a free audio tour, narrated by Emmy and Tony Award-winning actor John Lithgow. As you listen to the captivating story of how Walt Disney Concert Hall was built, explore the beauty and genius of the concert hall, or stroll through the peaceful Urban Garden, filled with a variety of plants, trees and flowers. From the concert hall, walk one long block north on Grand Ave. to take a look at the rest of the Music Center complex on your left. The original center includes the Dorothy Chandler Pavilion, Mark Taper Forum and Ahmanson Theatre (named after three of LA’s major cultural benefactors). At the northeast corner of Grand/Temple is the Cathedral of Our Lady of the Angels, designed by Pritzker Prize winner José Raphael Moneo of Madrid. From the central plaza, enter through the sculptor Robert Graham’s bronze doors, an homage to Ghiberti’s bronze baptistry doors in Florence. The austere sand-colored structure is most inspiring from the inside, where the soaring heights and alabaster clerestory windows create a strong atmosphere of serenity and peace. Artist John Nava’s tapestries — larger-than-life realistic depictions of 135 saints and believers — line the fresco-like walls. Pick up your car and drive north to Cesar Chavez Blvd. Turn west. The street changes name to Sunset Blvd. within a few blocks. Drive approximately 3 miles to Santa Monica Blvd., which veers off just past Sanborn (small street). This section of Sunset Blvd. and Santa Monica Blvd. is part of historic Route 66. On your left is the Hollywood Forever Cemetery, the final resting place for more studio heads and stars than any place in the world. Elaborate tombs, mausoleums and headstones dot the cemetery. The 1920s heartthrob Rudolph Valentino is buried here, plus Cecil B. De Mille, Marion Davies, Tyrone Power, Jayne Mansfield, Douglas Fairbanks (Jr. and Sr.). There are even video life stories on screens embedded in stones. Exit the cemetery on Santa Monica and drive west to Gower, then north to Hollywood Blvd. 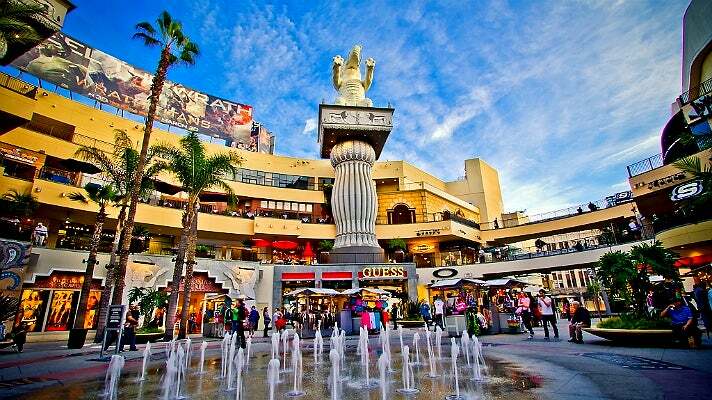 At the northwest corner at Highland is Hollywood & Highland Center pay-parking underneath, be sure to get a validation). This dramatic new landmark is filled with shops and eateries, perfect for people watching. From one of the upper walkways, get a perfect photo of the Hollywood Sign. You can also get a great look at the El Capitan’s ornate marquee, Disney’s flagship movie theater and where “Jimmy Kimmel Live” originates. As you walk west, check out the Hollywood Walk of Fame — bronze stars set in terrazzo honoring the preeminent people and personalities in the entertainment industry. The commotion in front of Grauman’s Chinese Theatre goes on all day, every day. Then explore the courtyard itself with famous footprints and handprints of stars from Shirley Temple to Johnny Depp. Continue west on Hollywood Blvd. to Fairfax Ave. You’ll be in a residential area for the last few blocks. Turn south to Third St., where you can stop at the Farmers Market for a leisurely alfresco lunch. The colorful market is one of LA’s favorite pastimes, and you can get anything from caramel apples to sushi, kebabs to fresh fruit and pizza-by-the-slice to gourmet hot dogs. Leave the Market by the Fairfax Ave. entrance and drive south to 6th then left to Curson. Turn right and into the pay lot. From here, take a stroll through Hancock Park, home of the La Brea Tar Pits, one of the few live excavation sites in the country. After the tar pits, cross Wilshire at Curson and check out the Craft and Folk Art Museum. Admission is only $5. Make sure to visit the museum gift shop, continually voted as one of LA’s bests. Walk west on Wilshire to Los Angeles County Museum of Art's (LACMA) regal entrance. There’s an elevator to the right if the staircase look daunting. Time your arrival to after 5 p.m. when the museum galleries are free (you’ll still need to go to the admission window for a sticker). Gallery buildings surround the plaza, where you’ll find a comprehensive collection of art from ancient Egypt to 21st-century contemporary work. Open until 8 p.m, Fridays to 9 p.m. Closed Wednesdays. If you want a different taste of art, you might choose to explore the Getty Center. Admission is free, while parking is $15. Continue down Fairfax Ave. to I-10, go west to I-405, then north to Getty Center Dr. Here you’ll find a spectacular collection with some of the world’s most treasured impressionist paintings such as van Gogh’s Irises. Stroll through the Stark Sculpture Garden at the Getty Center, a 28-piece collection of modern sculptures from legendary film producer Ray Stark and his wife, Fran. Featuring works from the 20th century's greatest sculptors, the outdoor sculpture garden consists of a series of intimate and peaceful outdoor gallery rooms designed to invoke contemplation and conversation among viewers. You can also take a free cell phone audio tour by calling 310.499.9236.